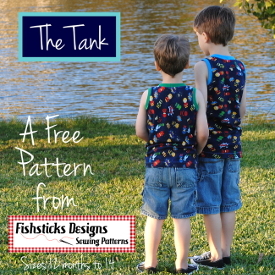 I introduced the Go Fish Series last fall, and I’m thrilled that all of you seem to enjoy these “instant gratification” projects as much as I do! 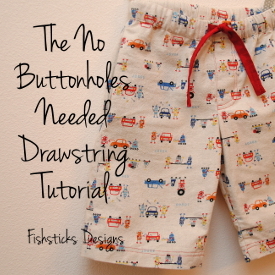 They’re definitely my favorite type of sewing. In case you’re not familiar with them, these quick-to-finish projects are also eco-friendly with no pattern pieces to print. 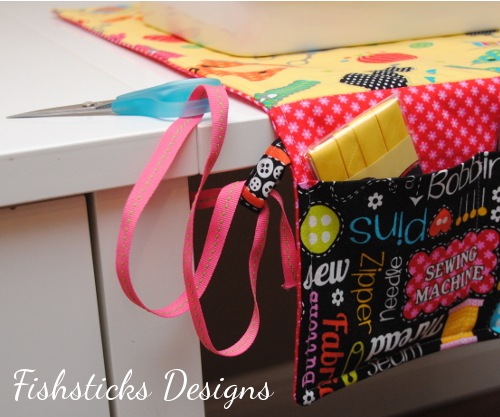 You just measure and cut using your quilting mat and rotary cutter following the included measurements or instructions. 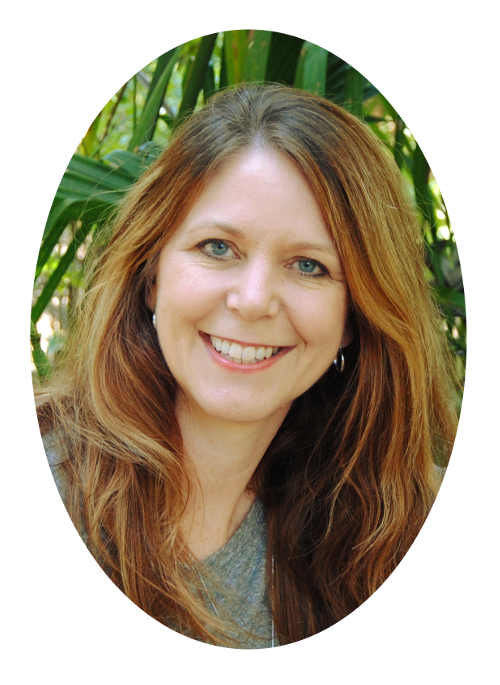 They are easy projects, but they aren’t completely “no frills” projects. Each one has something new to learn or a way to challenge yourself if you’re still learning. They are great for beginners, though! 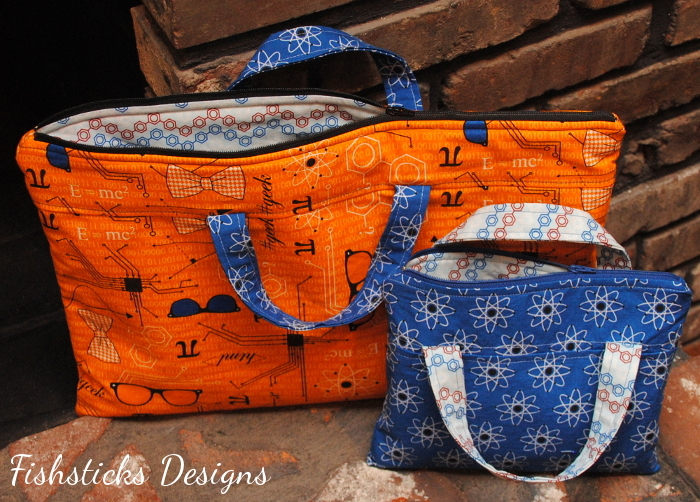 These little patterns are available as PDFs on my site and as tri-fold sewing cards in your favorite local quilt shop. Both are priced at $4.25 each. 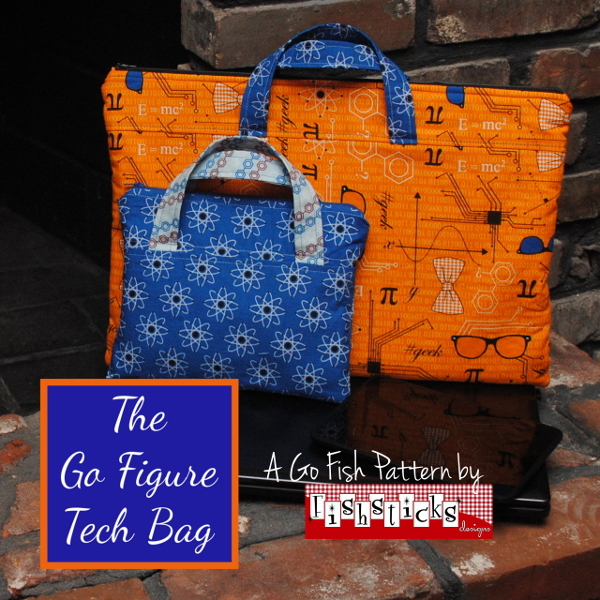 First on the list is the Go Figure Tech Bag. This bag has a zippered top, and it’s padded with fusible fleece to give a bit of extra protection to your electronic devices. This pattern is designed to fit any device from e-reader size to laptop size with customized measurements. The instructions for measuring and figuring are really simple — I promise! 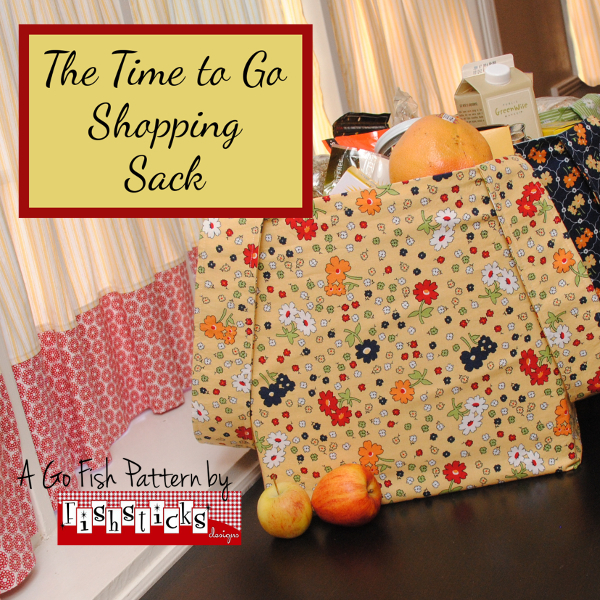 Next up is the Time to Go Shopping Sack. I’ll admit that I really wrote this pattern for myself! 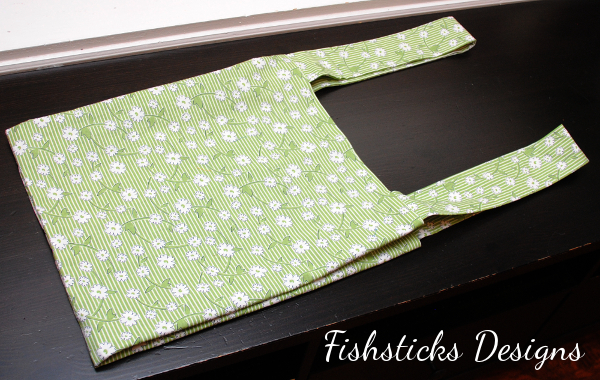 I love having pretty reusable grocery bags to use for shopping, but I’d never found a pattern that was just what I wanted. 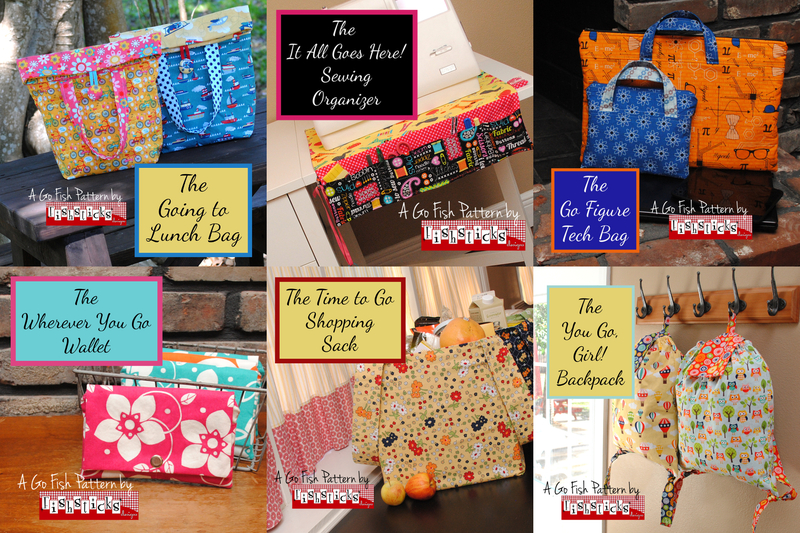 These bags are super roomy with wide handles. The gusset allows them to lay flat for easy storage and open up to a full 4″ wide for holding big boxes. 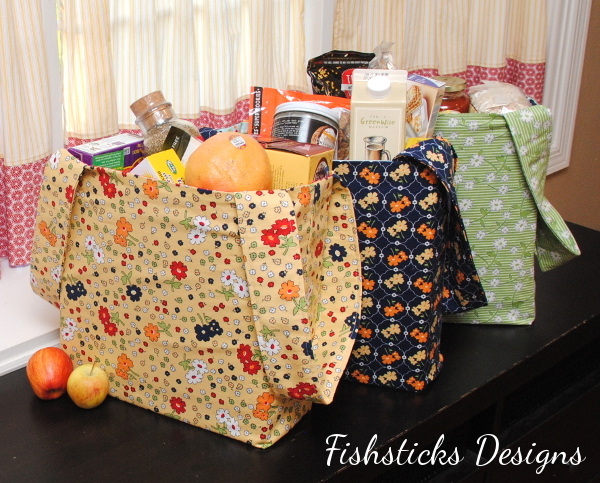 They’re also finished with a french seam at the bottom to keep your produce and canned goods safely inside! 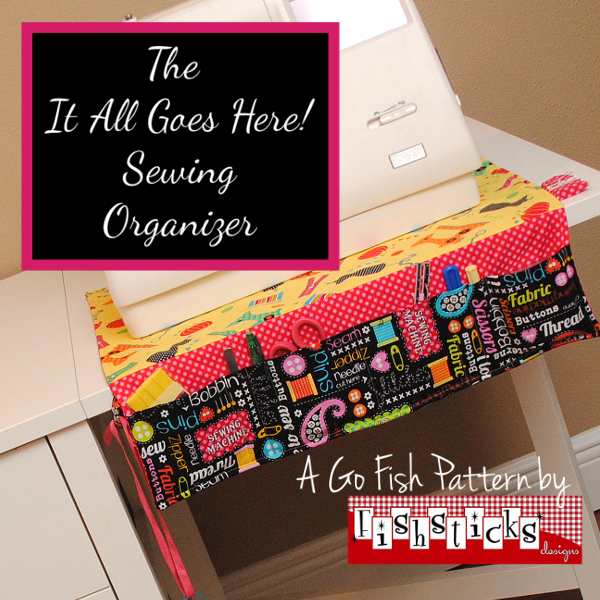 The It All Goes Here Sewing Organizer is perfect for keeping things right where you need them while you’re at your sewing table. 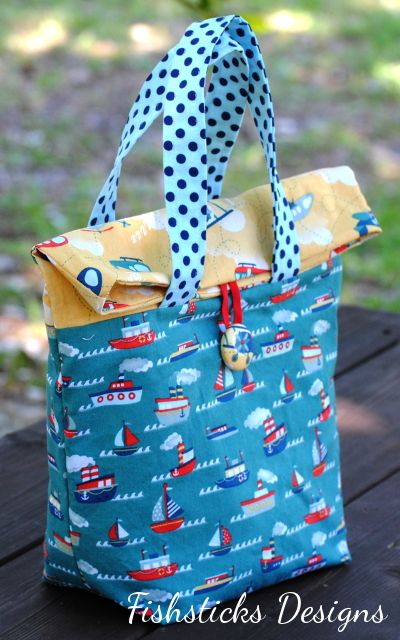 (It also folds up nicely with your sewing notions in the pockets in case your sewing space is one that comes and goes with breakfast and dinner!) 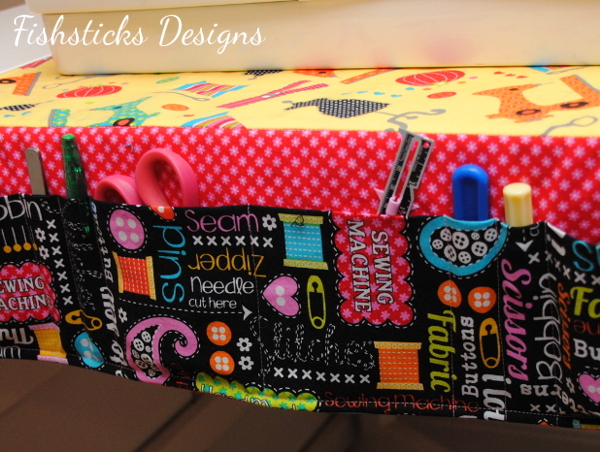 This organizer has four large pockets and four small pockets to hold your trimming scissors, seam ripper, screw driver … whatever you need on hand. There’s a small loop on one side that you can use to tie a pair of scissors where they won’t walk away. 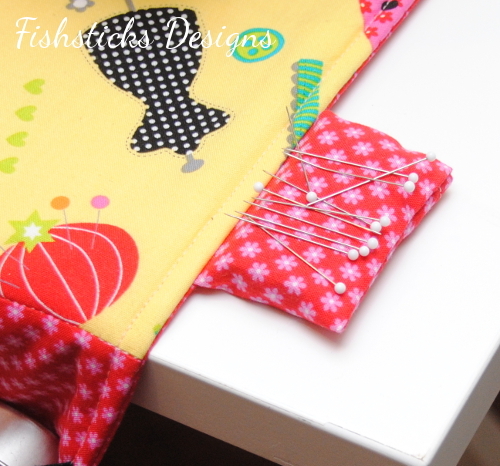 And, my favorite feature of the Sewing Organizer is this little magnetic pin holder! I love that I have far fewer pins landing on the floor these days. The magnet is removable so the whole organizer can be thrown into the wash whenever it needs to be. 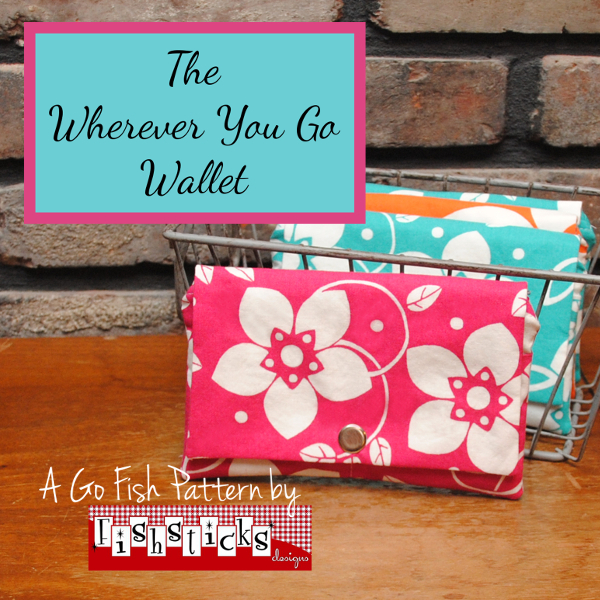 The Wherever You Go Wallet is quick and easy to sew, but it still offers plenty of storage and organization space. 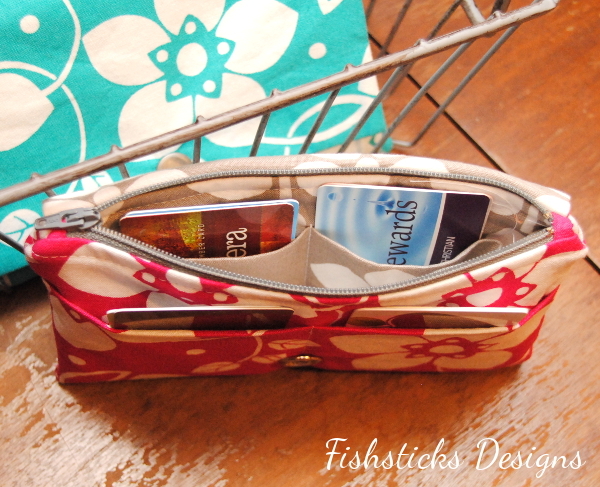 It has a zippered top, a flap closure with a snap and four credit-card sized pockets. 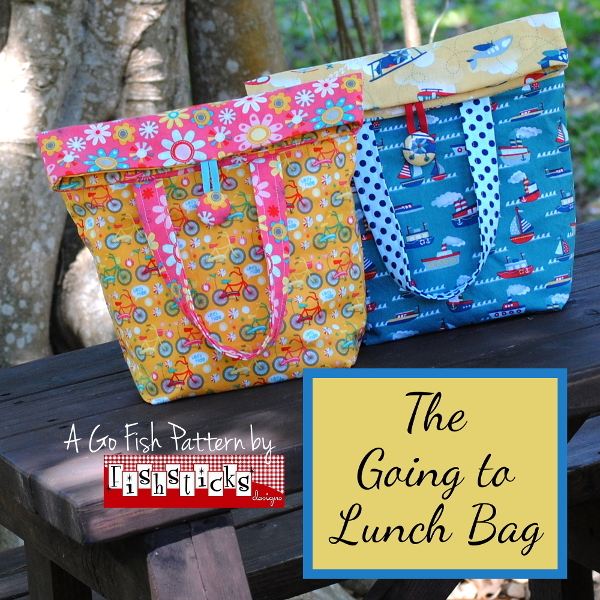 The Going to Lunch Bag is sized just right for grown-ups and kids alike, and it’s the perfect take-along for lunch at school, work or a day at the zoo! The roll-down top stays open on it’s own when rolled up to make filling the bag easy, and when it’s packed and ready, it rolls down and fastens easily for both adults and children alike. 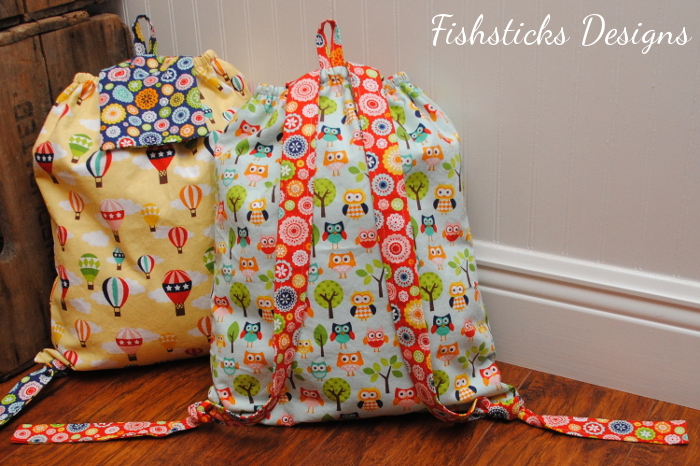 You can make it with your choice of fabrics and interfacing to add insulation or water resistance, too. Finally, the You Go, Girl! 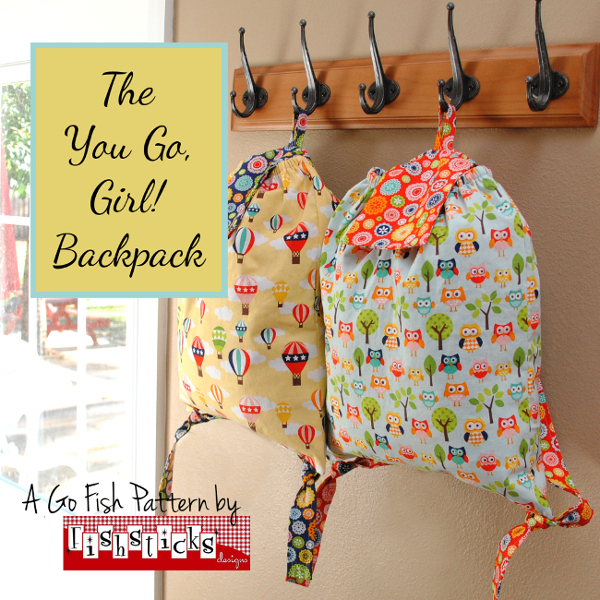 Backpack is the perfect carry-along for teens and preteens. The tie-on straps are my favorite feature of this bag. 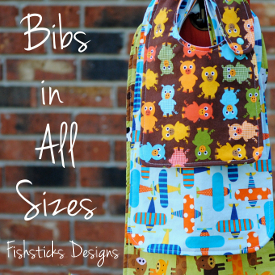 They add a bit of modern detail and fun, and they make it much faster to sew than if you were adding hardware. This backpack also features an elasticized top and a fold-over flap with a magnetic snap closure. 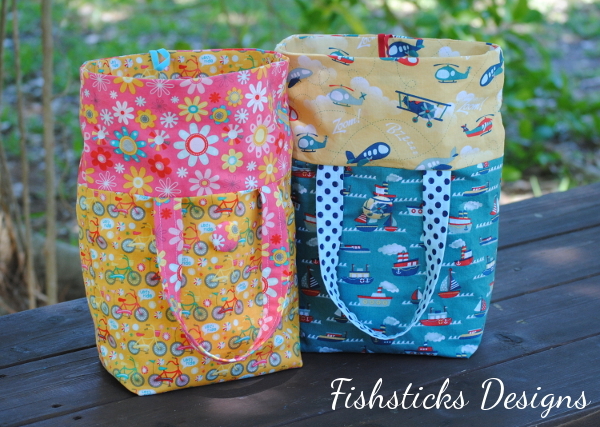 « The Fishsticks Spring 2014 Quilt Market Booth & a Giveaway! I just finished making the On-the-Go Travel Pillow and had to tell you what a wonderful project it is. 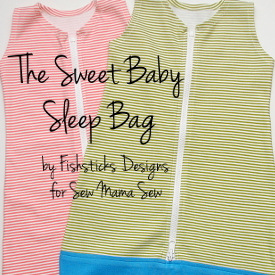 So simple to sew and a clever design.